The Low-Energy High-Performance Building Façade Solutions research program supports industry efforts to develop, assess, and promote energy-efficient window and daylighting technologies and systems for new and existing buildings. The program provides industry access to state-of-the-art instrumentation, technical expertise, and collaborative opportunities that help bring innovative products to market more quickly. LBNL researchers collaborate with manufacturers, architects and engineers, utilities, building owners, and state officials to bridge the gap between initial concepts and market adoption. 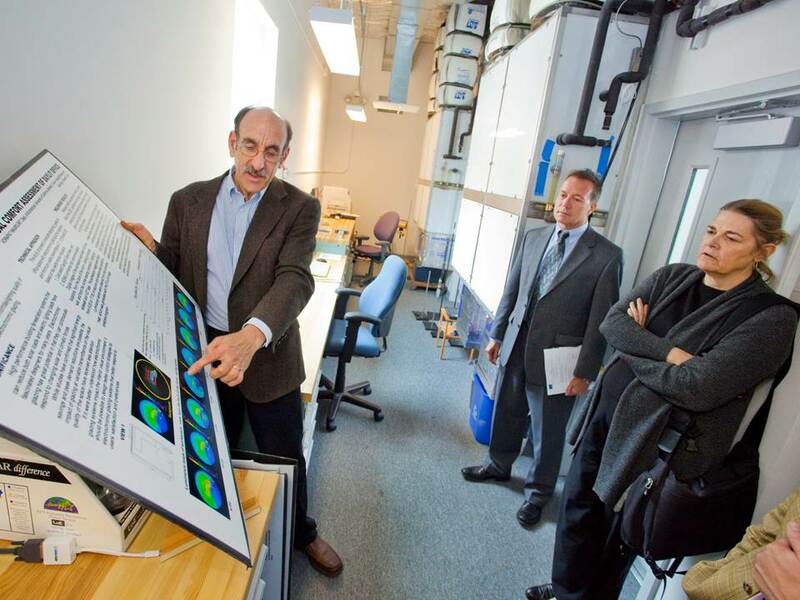 Scientists use the unique research facilities and capabilities of the Energy Techologies Area—as well as those of related divisions such as Material Sciences and Accelerator and Fusion Research—to develop, test, and evaluate innovative façade technologies. Through improved design and/or in combination with other building systems, these technologies can provide significant reductions in heating, ventilation, and air-conditioning (HVAC) and lighting energy use in buildings while improving comfort and amenity in the built environment. An integrated approach to façade design enables one to optimize the energy use and comfort tradeoffs necessary to achieve a balanced solution. Often designers must choose between admission of daylight or mitigating glare and solar heat gains, controlling direct sun but blocking views to the outdoors. Better solutions provide a comfortable, energy-efficient, and productive living environment. Development of affordable, effective technologies, systems, controls, and strategies is essential for achieving widespread reductions in energy use worldwide, thus meeting zero net energy use and carbon emission reduction goals. For more than 30 years, LBNL researchers have defined strategic directions for R&D and innovation using practical, high-level assessments of the technical and market potential of various fenestration technologies and strategies. Stephen Selkowitz, Senior Advisor for Building Science, and the Group Leader of the Windows and Envelope Materials Group, explains measured outcomes from full-scale field tests to visitors inside the Advanced Windows Testbed Facility. Selkowitz, Stephen E. "Singapore's Zero-Energy Building's Daylight Monitoring System." International Conference on Applied Energy 2010: Energy Solutions for a Sustainable World. Singapore, 2010. LBNL-3708E. Selkowitz, Stephen E, Eleanor S Lee, and Øyvind Aschehoug. "Perspectives on Advanced Façades with Dynamic Glazings and Integrated Lighting Controls." CISBAT 2003, Innovation in Building Envelopes and Environmental Systems, International Conferences on Solar Energy in Buildings. Ecole Polytechnique Federale de Lausanne, Lausanne, Switzerland, 2003. Selkowitz, Stephen E, Øyvind Aschehoug, and Eleanor S Lee. "Advanced Interactive Façades — Critical Elements for Future Green Buildings?." GreenBuild, the annual USGBC International Conference and Expo. 2003. LBNL-53876. Shehabi, Arman, Charles N Eley, Dariush K Arasteh, and Phil Degens. A Characterization of the Nonresidential Fenestration Market. 2002. LBNL-52699. Tribble, Alison, Kate Offringa, Bill Prindle, Dariush K Arasteh, Jay Zarnikau, Arlene Stewart, and Ken Nittler. "Energy Efficient Windows in the Southern Residential Windows Market." 2002 ACEEE Summer Study on Energy Efficiency in Buildings. Pacific Grove, CA, 2002. LBNL-51425. Arney, Michael, James Fairman, John Carmody, and Dariush K Arasteh. The Integrated Energy-Efficiency Window-Wall System. 2001. LBNL-51466. Selkowitz, Stephen E. "Integrating Advanced Façades into High Performance Buildings." Glass Processing Days: 7th International Conference on Architectural and Automotive Glass. Tampere, Finland, 2001. LBNL-47948. Arasteh, Dariush K, Robin Mitchell, Christian Kohler, Charlie Huizenga, and Dragan C Curcija. "Improving Information Technology to Maximize Fenestration Energy Efficiency." Performance of Exterior Envelopes of Whole Buildings VIII. Clearwater Beach, FL, 2001. LBNL-48147. Klems, Joseph H, Elizabeth U Finlayson, Thomas H Olsen, David W Banks, and Jani M Pallis. Toward a Virtual Building Laboratory. 1999. LBNL-43006. Selkowitz, Stephen E. "High Performance Glazing Systems: Architectural Opportunities for the 21st Century." Glass Processing Days 99 Conference. Tampere, Finland, 1999. LBNL-42724. Lee, Eleanor S, and Stephen E Selkowitz. "Establishing the Value of Advanced Glazings." Glass in Buildings: An International Conference on the Use of Glass as an Architectural/Engineering Form and Material. Bath, UK, 1999. LBNL-42761. Selkowitz, Stephen E. "The Elusive Challenge of Daylighted Buildings 25 Years Later." Daylighting 98 Conference. Ottawa, Ontario, Canada, 1998. LBNL-41414. Selkowitz, Stephen E, and Eleanor S Lee. "Advanced Fenestration Systems for Improved Daylight Performance." Daylighting 98 Conference . Ottawa, Canada, 1998. LBNL-41461. Eto, Joseph H, Dariush K Arasteh, and Stephen E Selkowitz. "Transforming the Market for Residential Windows: Design Considerations for DOE's Efficient Window Collaborative." 1996 ACEEE Summer Study on Energy Efficiency in Buildings. Pacific Grove, CA: ACEEE, 1996. LBNL-42254. Frost, Karl J, Joseph H Eto, Dariush K Arasteh, and Mehry Yazdanian. "The National Energy Requirements of Residential Windows in the U.S.: Today and Tomorrow." ACEEE 1996 Summer Study on Energy Efficiency in Buildings: Profiting from Energy Efficiency. Pacific Grove, CA, 1996. LBNL-39692. Arasteh, Dariush K. "Advances in Window Technology: 1973-1993." Advances in Solar Energy, An Annual Review of Research and Development. 1995. 339-382. LBL-36891. Frost, Karl J, Dariush K Arasteh, and Joseph H Eto. Savings from Energy Efficient Windows: Current and Future Savings from New Fenestration Technologies in the Residential Market. 1993. LBL-33956.